This kitchen from House Beautiful has so many things I love. I love all the white but with the bright pops of color brought in with the fruit and the flowers. I also love the use of the dark wood against all the white. 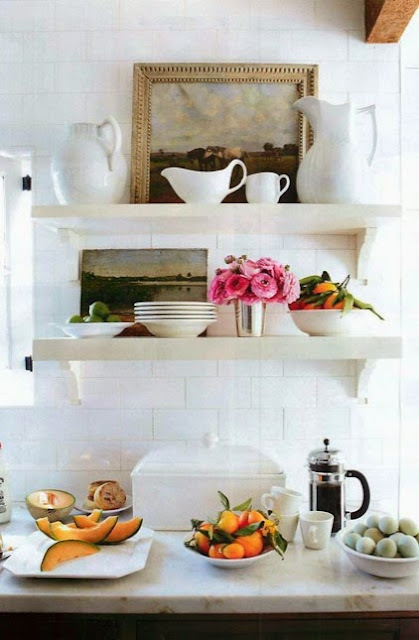 The unexpected use of this framed photo on the shelving with all the dishes is great. I have also added a few new items to my etsy shop. While the entire white rooms are very pretty they have always left me feeling as though the room isn't finished. With the darker or color added it grounds the room....at least for me. I try to avoid trends and go with what gives me the feel I want when I enter the door. For many years I tried to have a look others would like when THEY entered the door. We're all after a different feeling or mood. I notice that need changes a bit with the different stages of our lives. When my children were young with lots of toys, at that time, lots of white worked to calm the primary color overload. Oh my, sorry for such a windy post! 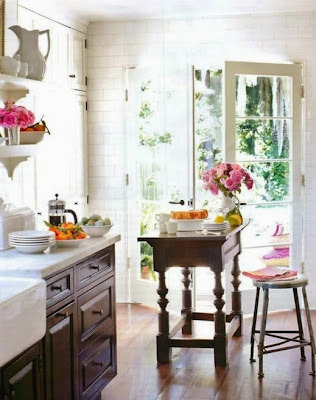 Do you know where I can find more pics of this kitchen? I didn't see it on House Beautiful. I love it!!! My kitchen is dark wood, and I have been longing for white cabinets. But, maybe all I need is some white on the walls and some color! I need more inspiration! I saw this kitchen in the magazine this past summer while in Colorado on vacation. I still look through that magazine REGULARLY and I love, love, love that kitchen. wow...that's a good one! beautiful accessories just get me every time. Hi Melanie~~~ That is too funny, I have the same pictures pulled in my file of things I LOVE!!! There is just something special about that particular kitchen:)) LOve your blog and would love for you to check out mine. I have family in Washington. It is so fun to visit them. They are in Port Townsend. Beautiful.....has a great feeling to it. Love the open airiness, like it kind of beckons you in. Ok, you are not going to believe this, but I actually wrote a post about this same kitchen last year when I got my issue of House Beautiful and after much decision we decided to proceed with the renovation inspired by this same photo next November after I am done with school. I think it says something about the design when a photo can inspire people to emulate that style. @ Lynette, the HB website did not post any of the photos but if you go to Chris Barrett's website (she owns the home and designed the kitchen) you can find more there: http://www.chrisbarrettdesign.com/ There is where I got the photos for our architect. Love the kitchen it looks unique not like you'd see everywhere else. The wood adds so much warmth. Oh, I love this one too! I think this spindle table just makes it. I love how House Beautiful can make me feel good about my small house by showing amazing design in small spaces. I'm so with you on this! It's a favorite of mine too! it has such character, such warmth, yet fresh and bright! I love the vintage photos in the bottles!